Layers of vanilla mugcake, strawberry (protein) cream, and strawberries combine to make this pretty little creation that you can easily take on the go, if need be. Also has the option to be made dairy free if you use dairy free milk, yogurt, and protein powder! 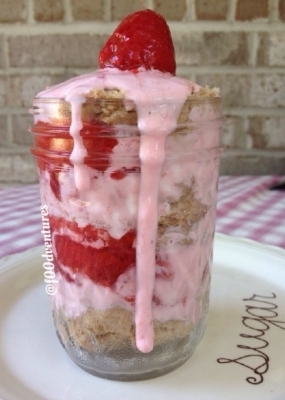 Get out a small jar and throw in a chunk of your mugcake then layer it with your strawberry cream and a couple strawberries. repeat process until you reach the top of your jar. enjoy!